Mrs. Antonia Alvino arrived to St. James Rehabilitation and Healthcare Center on August 21, 2017 from an inpatient hospitalization at Stony Brook University Hospital in Stony Brook, New York. Mrs. Alvino was diagnosed with Generalized Muscle Weakness and Essential Hypertension. This was first diagnosed when Antonia was at a restaurant casually having a delicious meal where all of a sudden she fainted, requiring her to seek medical care right away, and waking up in the hospital with no recollection as to what had happened to her. After an abundance of successful visits from her physicians in the hospital and numerous tests, Mrs. Alvino was notified that she was going to need extensive inpatient rehabilitation to support her muscular strengths and balancing techniques in order to return home on her own. While at Stony Brook Hospital, a Social Worker approached Mrs. Alvino and her family, highly recommending St. James Rehabilitation and Healthcare Center. With her family by her side, they all arrived together with the agreement that St. James would be the best fit for many positive reasons, one being St. James providing the best level of care for Antonia. Mrs. Alvino was ardently greeted by multiple professionals of Team St. James whom anticipated her arrival. Within the first 24 hours, she was greeted by clinicians, therapists, physicians, administrative staff and many other valued representatives of the team to welcome her and answer any questions that she or her family may have had. 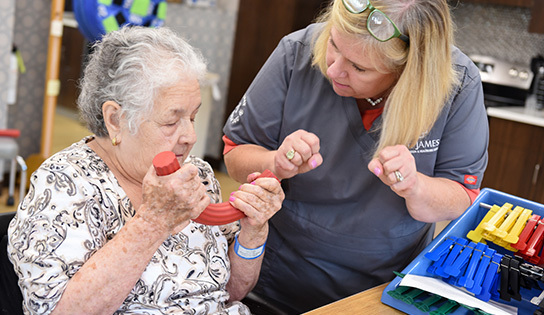 Her Physical and Occupational therapists, Joe and Jaime, began her therapy program at beside to evaluate her current state of health and mobility in conjunction with her most recent therapy/clinical notes from Stony Brook. Over the course of her stay thus far, she has progressed rather quickly. While on her rehab program, Antonia worked to build her endurance and perfect her movement techniques. Her goal was to have the ability to have moderate to no assist along with all other tasks that were expected of her. Within three weeks of being at St. James, she had accomplished almost a quarter of the tasks she was experiencing during rehabilitation. Additionally, Antonia was introduced to an at-home simulation to practice skills in performing her activities of daily living, which included bathing, transfers, dressing, etc. On November 29, 2017, Mrs. Alvino was discharged home with an eager excitement to celebrate the holidays with her family, and friends. Upon discharge, her ambulation increased from 100 feet to 200 feet and she was able to transfer independently achieving her goal. Team St. James is thrilled for Antonia and the incredible strides she achieved while under our care. We wish her nothing but the best and an unconditional happy and healthy 2017!